The 2015 Honda Accord is one of our most popular vehicles at Central Illinois Honda Dealers, but if you’re looking for a greener option for your 2015 family vehicle, the 2014 Honda Accord Plug-in Hybrid might be for you. If you haven’t heard of it or aren’t quite sure what it means for a car to be a “plug-in” hybrid, don’t worry, we’ll get to that in a minute. Electric cars may be the future for some drivers, but if you’re wondering what you’d do when you run out of battery, you’re not alone. And that’s where the Accord Plug-in comes in. It takes a hybrid powertrain and then gives you the ability to charge it and make short trips on electric power only, decreasing your dependency on gasoline without the risk of leaving you stranded. The 2014 Accord Plug-in has an EPA-estimated fuel economy of 124 city/105 highway/115 combined MPGe rating while running in electric mode, switching to 47 city mpg and 46 highway mpg when using the hybrid powertrain. * Even when you’re not running your short-range errands, it’s clear that the car is still one of the most efficient on the road. Despite the impressive fuel economy, the motors of the 2014 Accord Plug-in are rated at 141 hp and 55 hp for 196 hp combined, and it is loaded with some of the best in interior comfort and tech features. And that’s not even the half of it. 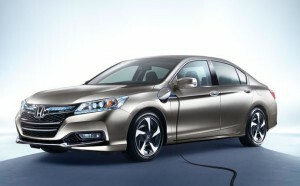 Honda has made this model one of the best-equipped sedans on the road, and its unique design ensures that your Accord will look like nothing else on the road. If you want to see whether or not the 2014 Honda Accord Plug-in Hybrid is your 2015 family vehicle, you should see it firsthand. Contact a Central Illinois Honda Dealer today to learn more about this unique car, including how you could drive one home. *124 city/105 highway/115 combined miles per gallon of gasoline-equivalent (MPGe) electric rating; 47 city/46 highway/46 combined MPG gasoline only rating. 13 mile maximum EV mode driving range rating. 570 mile combined gas-electric driving range rating. Ratings determined by EPA. Use for comparison purposes only. Your MPGe/MPG and driving range will vary depending on driving conditions, how you drive and maintain your vehicle, lithium-ion battery age/condition, and other factors. For additional information about EPA ratings, visit http://www.fueleconomy.gov/feg/label/learn-more-PHEV-label.shtml.